Is everybody happy? Our bus to motor home renovation. : Its alive, ITS ALIVE! Power is ON. Its alive, ITS ALIVE! Power is ON. We finally got the power connected. We bought all of this stuff about a year and a half ago. It was from our local Jayco dealer and since then we have added lots of electrical goodies to our 'stash'. USB ports, ciga ports, etc, etc. We've gradually been doing wiring and putting lights on as we go. We even installed the solar panels but they weren't connected to anything. Remember this from WAAAAAY back? We managed to hide the cables as we went. The 25mm conduit and saddles are from Bunnings. Most of our electrical gear came from this guy who lives in our next biggest town but he has an eBay store http://stores.ebay.com.au/autoelecau?_trksid=p2047675.l2563 We bought metres and metres of 6mm wire from him. Good quality and nice and thick. -Alternator charger thingo and a relay switch so the solar shuts off and the alternator does the charging when in motion. -Solar regulator and thermometer to shut down if it gets too hot. -Solar display and data cable. -A Narva 8 switch and fuse panel. -Heaps of various wiring, shrink wrap etc. Anyway, my husband is an ex-electrician so I was pretty confident that all would be well. The panels went on with rivnuts, rubber, Sikaflex and rivnuts AGES ago. Wiring joins are tucked away neatly in junction boxes and wire is in conduit which is saddled to the roof. Pretty sure I blogged about it back then. Next... well, lets let the photos do the talking. Inside wiring is mostly inside the top cupboards and 'capped' with these things. It basically means we can work on stuff without ripping walls off. This stuff is from Bunnings. Batteries have to be vented to the outside because they can produce hydrogen gas when charging. A few 5mm holes in the floor are fine according to the engineer. These batteries are good quality and are almost guaranteed not to do it. Best to be safe though! They also need to be locked down with a strong bracket (see the one on the right) and sealed so they won't leak to the inside of the caravan. Don't ask me about wiring, I don't know. 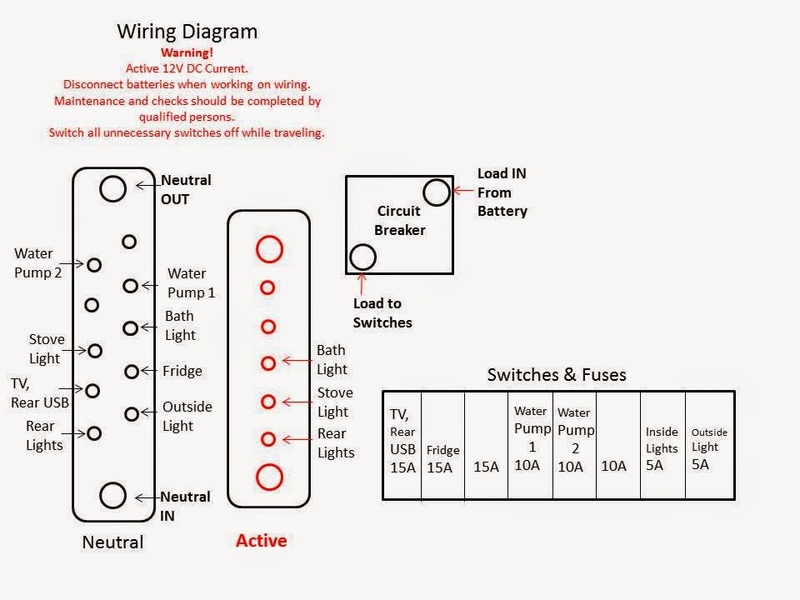 I would suggest getting wired in by an auto-elec if you don't know about this stuff. Regulator on the right, alternator charger on the left (not wired in yet). There is a big fuse wired in somewhere and a temp monitor too. These are protective devices to save the equipment in extreme conditions or if there is a surge. I may get a 240 charger at some stage and add a port to the outside... depending on if we find we need to or not. Also, I may get an inverter. At this stage, we are not planning to have one though. Here is the remote solar monitor. You can also see the cords above the door, There ended up being more than this lot though! Hidden by a padded head bumper thingo I made. The light under it runs on the bus' internal lighting system. Spaghetti. This all comes into a pantry type cupboard behind my passenger seat. That circular thing on the right is a speaker. The square on the left is the monitor. The door has the switchboard set into it. Wiring in progress. You can see the bus bars and circuit breaker on the right hand side of the cabinet. The switch board also has a fuse for each switch. Don't forget to write everything down as you wire stuff in. 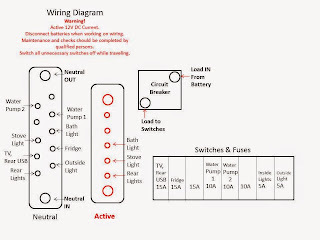 I've made a wiring chart to save the frustration in later years if we need to work on the wiring again. I've laminated it and will stick it in the back of the cupboard. As you can see, there is still space for other stuff to be added later. We are considering an outdoor ciga port for an additional fridge/freezer. Somehow the spaghetti has been tamed! Switches with the cover off, you can see the fuses. The fridge is working. Awesome. Lots of light for the kitchenette. Bead head lights are good too! Lets just switch them all on. Glow in the dark. I'm pretty happy with that!